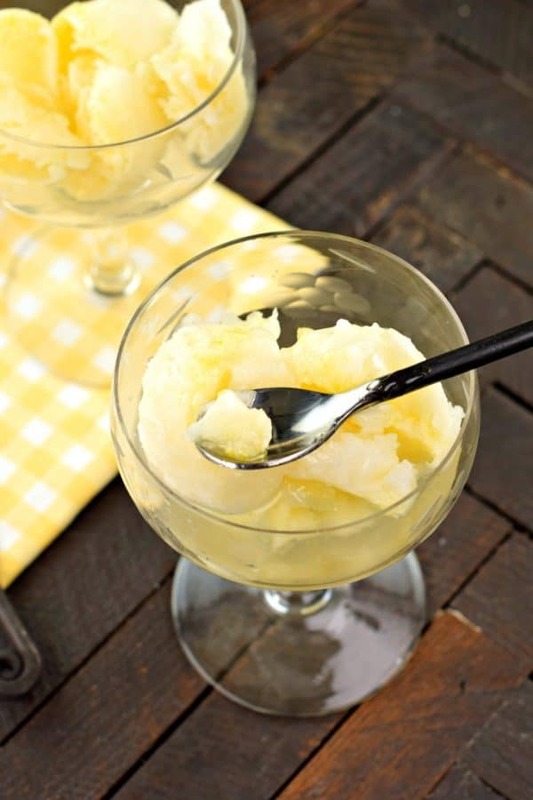 Smooth, sweet, and tart describes this deliciously, Easy Lemon Sorbet recipe! No ice cream maker needed! Add an optional shot of vodka for the perfect palate cleanser! Earlier this week I mentioned going on a cruise to Mexico with Princess Cruises. 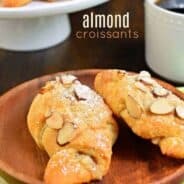 I mentioned some of my favorite things to do once boarding the ship, as well as sharing a delicious recipe for Jam filled doughnuts, much like the ones you get at the International Cafe on board the Crown Princess. But I need to tell you about the excursions. Princess Cruises does a fantastic job providing the most amazing opportunities while at port. 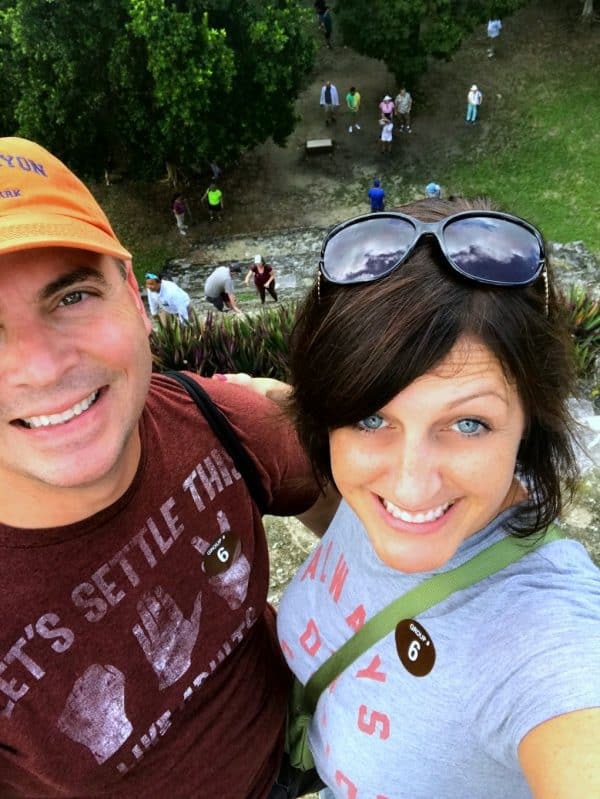 Our first day at port was Costa Maya, and my husband and I knew we wanted to explore the Mayan Ruins. Our bus ride was entertaining (thanks to our funny tour guide), and worth the drive to see the ruins. I had no idea how awesome these would be to see in real life. If I were to imagine what the Garden of Eden looked like, this is what I would envision. We had plenty of time to explore, climb, take photos, and just enjoy our day here. 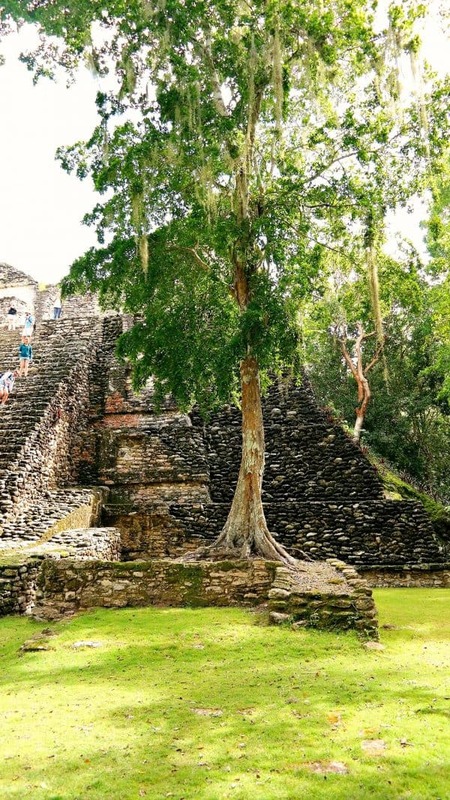 In Costa Maya we visited the Dzibanche Mayan Ruins as well as the Kohunlich Mayan Ruins. 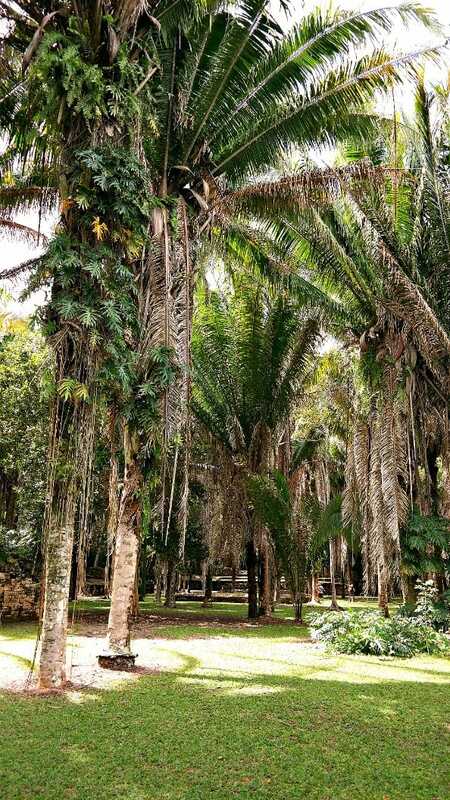 Both are beautiful kept grounds surrounded by a lush jungle. One of the other many things I absolutely love about Princess Cruises is the food. Every meal had a dish that just wow’d me. After a couple of fun days exploring Costa Maya and Cozumel, we came back to the cruise ship for a Chef’s Dinner. 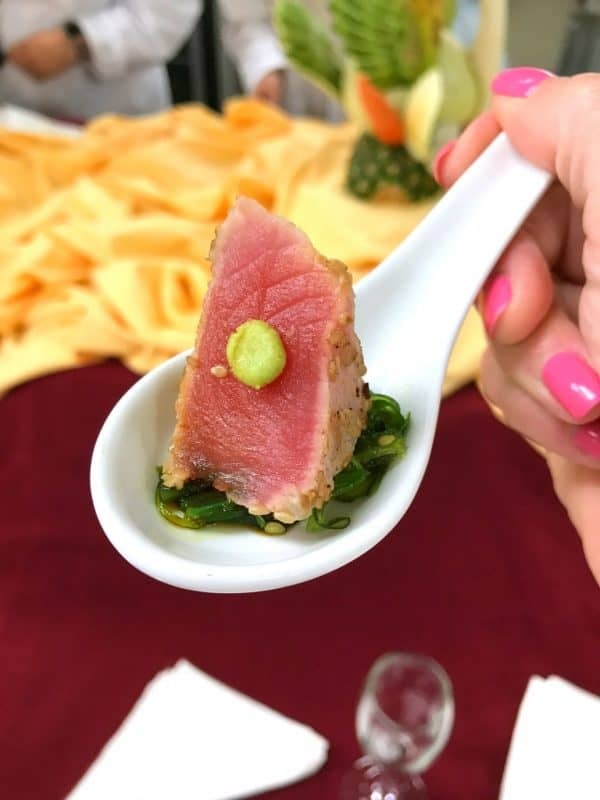 In addition to all the other things I mentioned about “what to do once boarding your cruise” you’ve got to add “sign up for Chef’s Dinner” to the list! It’s also a first come, first serve experience with only a handful of available seats on each cruise. But what you’ll experience is absolute perfection. You’ll start by heading into the behind the scenes of the ship….the kitchen! Of course there is strict protocol on attire and everyone must first put on their white coats! 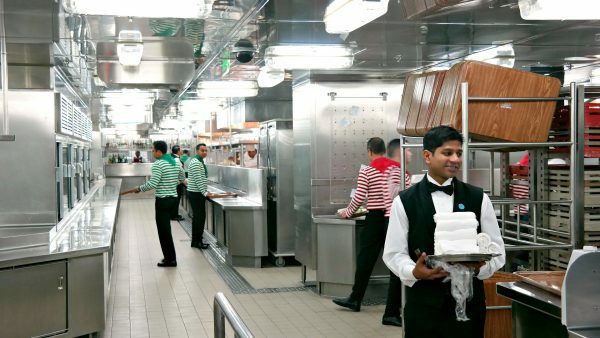 When you imagine a cruise ship kitchen, do you picture chaos and spills and drips and havoc? I did. There are a lot of people to feed on a ship, so I just pictured a mess (I’ve worked in a restaurant so I can tell you how messy they can get). 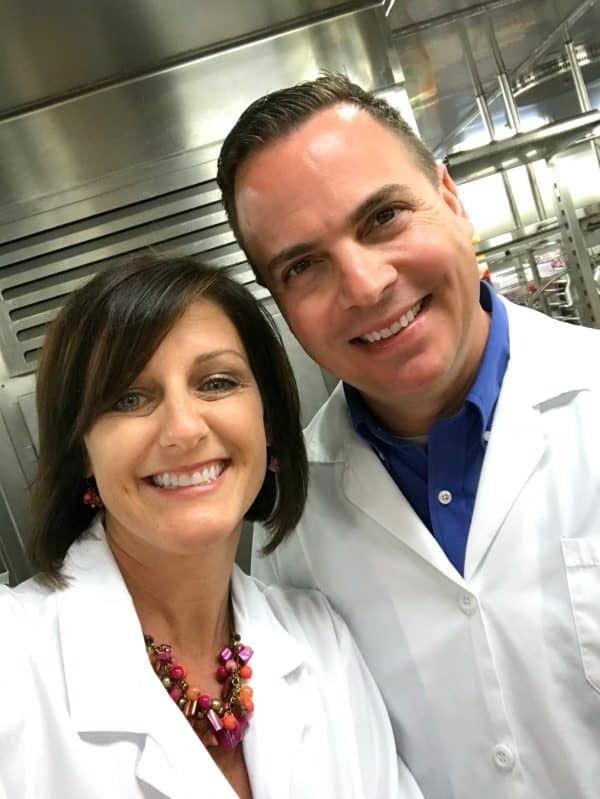 What you’ll find on a Princess Cruise however is pristine kitchens, and everyone smiling and truly loving their job. It was so fun to see. 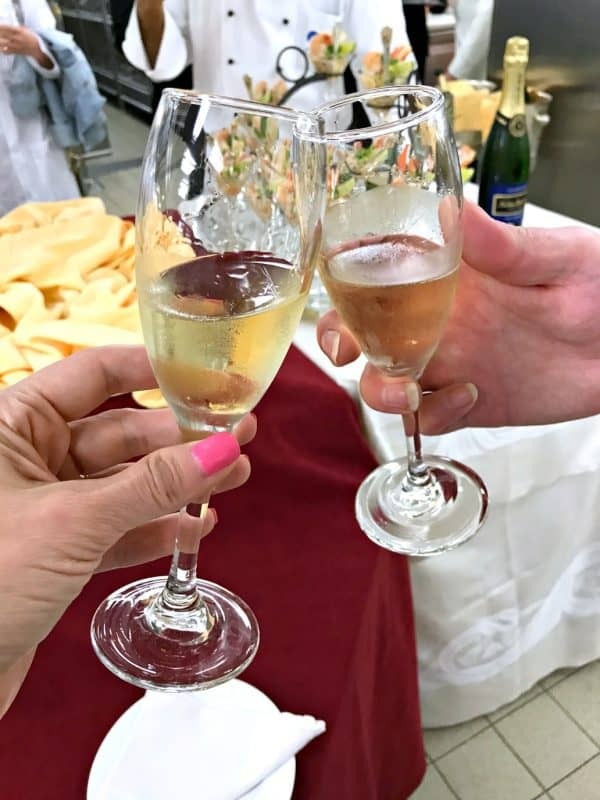 Of course the delicious appetizers they brought us while learning about the kitchen was wonderful too (as was the champagne…and yes, this is what YOU would get if you signed up too)! From the kitchen we made our way to an exquisite dining room experience. I wish I had photos of our dinner table, but the room was dark and moody and lit with candles so my photos didn’t turn out well. But we enjoyed a scrumptious dinner of Mushroom Risotto (OMG so good), Herb Crusted Rack of Lamb, Roasted Beef Tenderloin, potatoes, vegetables, and numerous delicious desserts! I loved it all, but in thinking about what can I make at home, haha, the sorbet is the winner (although they did give us a copy of their “Courses” cookbook that included the risotto recipe, so that may happen soon in my kitchen)! It also included a recipe for the Gnocchi Alfredo with Portobello Mushrooms. YUM. 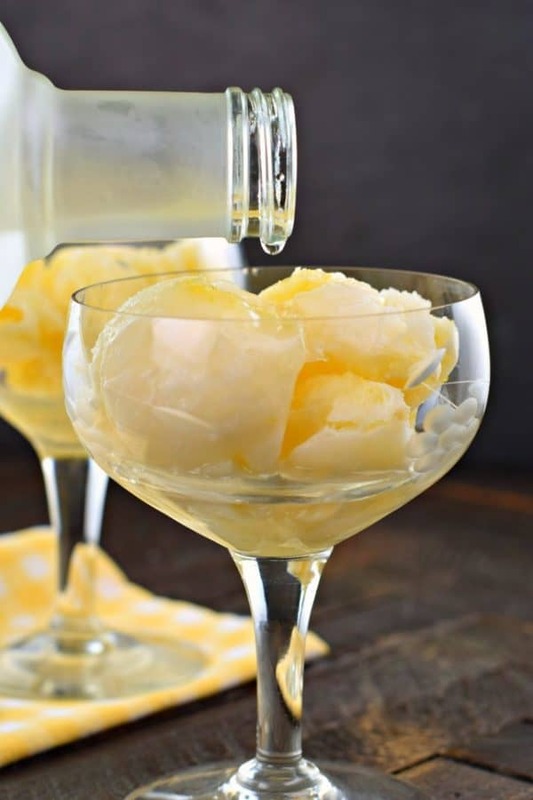 I am in love with the idea of hosting a fancy dinner at my house (you know, lasagna, bread sticks and salad, haha) and serving up a dish of this Easy Lemon Sorbet between courses. 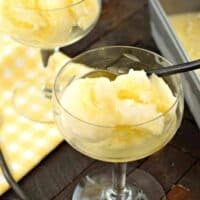 In case you’re wondering, my Lemon Sorbet recipe is so easy, and you don’t need to have a fancy ice cream maker for this recipe! The first thing you want to do is boil your sugar and water for one minute, this creates your simple syrup. Once it’s boiling, add in your grated lemon peel and simmer your mixture for about 5 minutes. Remove from heat and COOL COMPLETELY. Add in fresh lemon juice. Pour all of this into a freezer safe bowl, or bread pan (I used this 8-inch bread pan). Allow to freeze about 4 hours, or until firm. 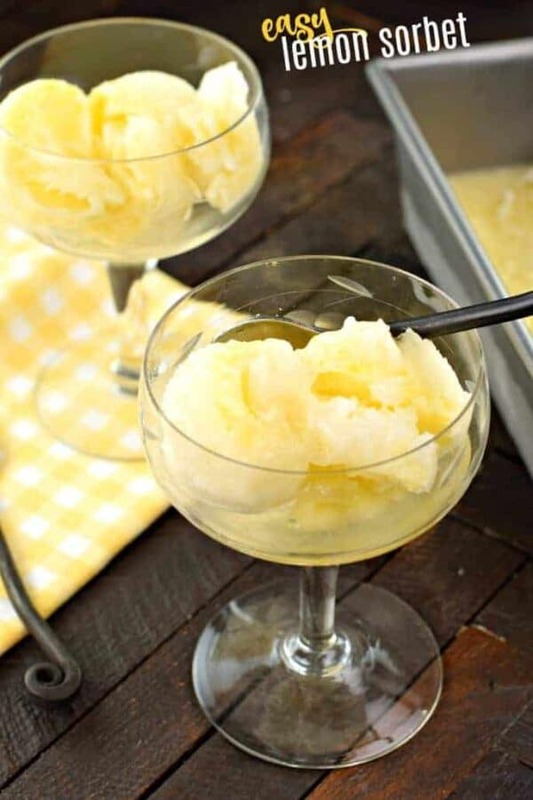 When you’re ready to serve, find some fancy martini glasses or wine glasses and put a couple scoops of sorbet in each glass (you may need to let the sorbet sit out about 10 minutes before scooping). 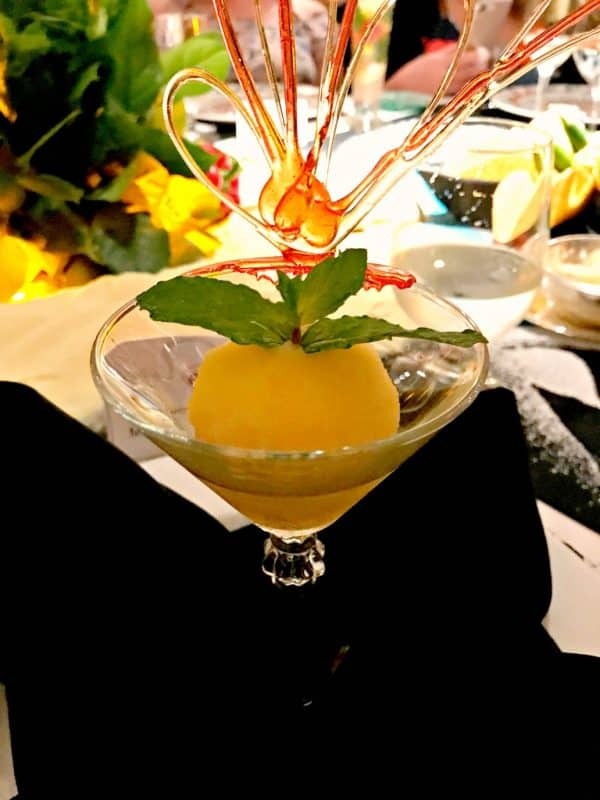 Once you’ve served your sorbet, offer everyone (who is of legal age, haha) a shot of vodka. I thought the vodka would be strong, but when you take a spoon of this tart sorbet with a little vodka it’s perfect. ENJOY! In a small saucepan, combine sugar and water. Bring to boil over high heat. Boil for one minute, stirring until sugar is completely dissolved. Reduce heat to low. Add in freshly grated lemon peel and simmer for 5 minutes. Remove from heat and cool completely. 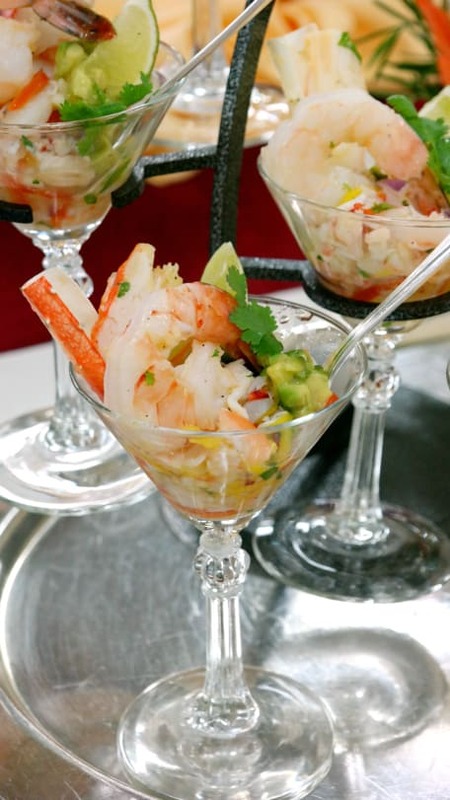 When ready to serve, scoop into a bowl (or fancy glass). Add a shot of vodka, if desired. Wow! Nice and Interesting Blog!. I loved your Lemon Sorbet recipe. 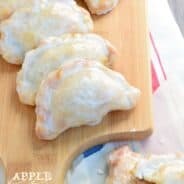 Simple and healthy recipe. I loved this!. Thanks a lot for sharing!. 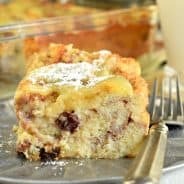 I am definitely gonna try this recipe today itself.